TRW-HP4M5W is wireless high power data two-way transceiver RF module. 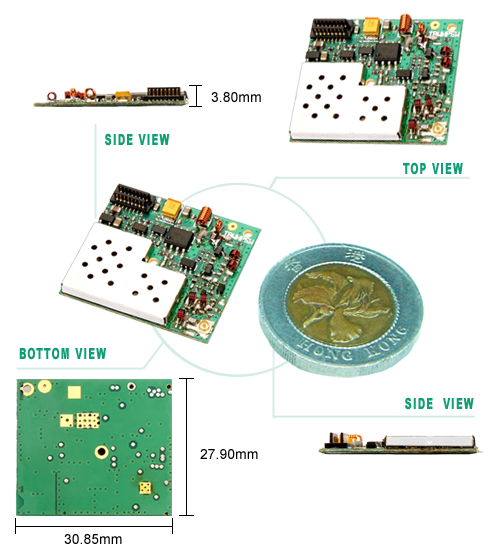 This module works at frequency between 432MHz to 436MHz (CE) with output power 5W. Ultra-high sensitivity achieves under -129dBm. The largest distance reaches around 20KM if a directional antenna works well with the transceiver. The build in Saw Filter can remove unwanted interference signals. This module is designed with fully digitalized structure. There is no need for further adjustment. This module has UR and I2C interface which not only provide convenient communication but also we can modify software to suit customers´ needs which includes special detecting point for voltage (A/D), current, output voltage (D/A). It does not need MCU to make an End product; this will save user time for design. Another key feature- it can stay in wide room temperature, between -10 and +70℃. The build-in AFC can auto-lock frequency, there is no need to worry about the shifting frequency after long period of operation. By adjusting the parameters from internal software, it enables to minimize potential interference occurring from close frequency and suits the need for various data communication. This product features wireless data transmission which offers the best solution to replacing wire/cord transmission as it is difficult to achieve long distance transmission.